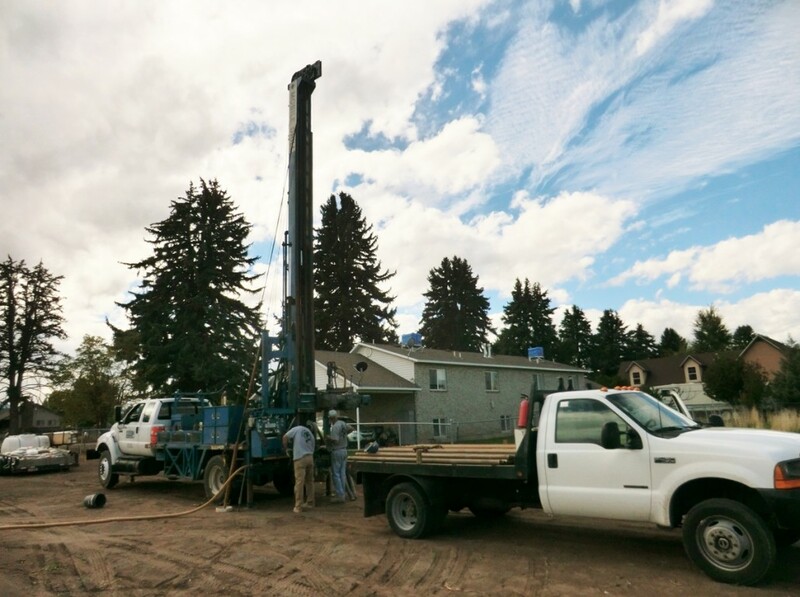 UGS oversees drilling on one of four new monitoring wells in Monroe City. 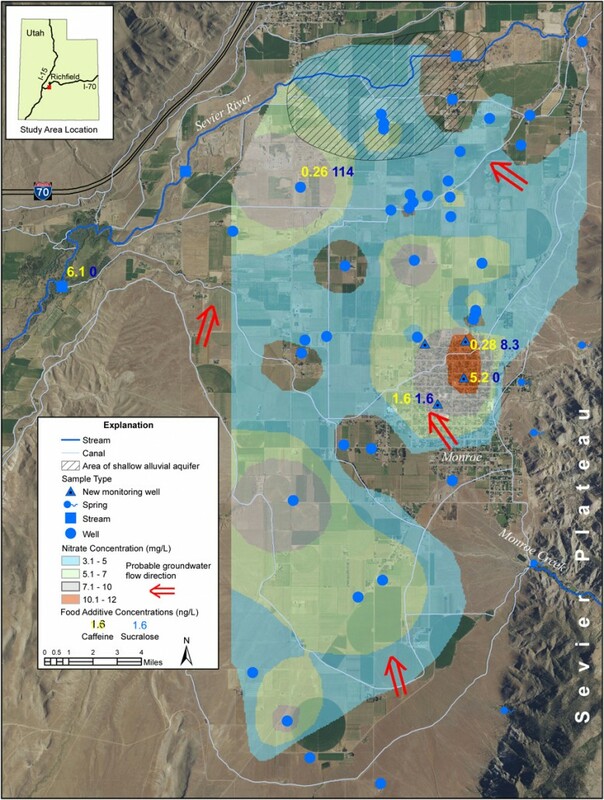 The Utah Geological Survey Groundwater Program recently used a multi-tracer approach that included caffeine and artificial sweeteners to identify sources of elevated nitrate in groundwater near the central Utah community of Monroe City. The U.S. Environmental Protection Agency warns that drinking water having nitrate concentrations greater than 10 milligrams per liter (mg/L) can be hazardous to human health. Previous work had revealed nitrate concentrations as high as 8 mg/L in domestic wells north of Monroe. Agriculture and septic tank leachate are the top two suspected sources for nitrate since most land in the Monroe basin is used for agriculture, which includes a sizeable dairy operation, and all rural and city residents (approximately 2300 people in a one-square-mile area of town) use septic tanks for wastewater disposal. Most wells in the valley pump water from an unconfined aquifer composed of interbedded valley-fill sediments. Depth to the aquifer is generally between 40 and 200 feet. A sequence of coarse-grained alluvium up to about 120 feet thick near the Sevier River contains a separate shallow aquifer, in which the depth to water is commonly less than 15 feet. Recharge from the Monroe Creek alluvial fan, leakage from canals and irrigation ditches, and irrigation infiltration drive the generally northward-flowing groundwater system. To pinpoint the source of nitrate, we drilled and installed four new monitoring wells into the top of the valley-fill aquifer underlying Monroe City. We found no evidence of perched groundwater underlying Monroe in the new wellbores, despite the presence of a seemingly continuous silty clay identified in each wellbore. Lack of perched water at the end of the irrigation season likely indicates that surface recharge and infiltration can travel downward 60 to 80 feet to the valley-fill aquifer. We sampled the new wells, plus existing wells, springs, and surface water sources for general chemistry and a suite of human-derived markers. Our approach combined nitrate distribution with chloride distribution; the occurrence of coliform bacteria (an indicator of surface influence), agricultural pesticides, caffeine, sucralose (an artificial food sweetener), and common human and livestock pharmaceuticals; and chloride-to-bromide mass ratios to trace nitrate to its source. Chloride-to-bromide ratios can be used as a tracer because the ratio in septic-tank leachate is higher than in livestock waste or fresh water due to salt in the human diet. The best quality groundwater is near the mouth of Monroe Canyon and south of irrigated cropland; conversely, water quality is poorest under Monroe City. The low level of nitrate in mountain springs and wells upgradient from developed areas indicates that nitrate from geologic sources is not a contributor to nitrate in Monroe basin groundwater. The two primary irrigation water sources for agriculture are the Sevier River and Monroe Creek, both of which have lower levels of total dissolved solids and nitrate than most of the groundwater in the basin. Groundwater quality in most wells in the Monroe basin shows impact from human activities. The average nitrate concentration in wells sampled for this study, excluding background wells, is 6.5 mg/L, a level indicating an average of 3.5 mg/L impairment above background due to human activities. The presence of coliform in some wells, all of which have elevated nitrate, suggests that surface influence, whether from septic tanks or agriculture, may be reaching the aquifer. Septic tanks are the most likely source of water-quality degradation underlying and northwest of Monroe City based on (1) nitrate near and above the primary drinking water standard (concentrations from 7.0 to 11.8 mg/L); (2) the occurrence of caffeine and sucralose at the top of the aquifer; (3) chloride to bromide mass ratios that are suggestive of human sewage; and (4) trace amounts of ammonia and nitrite, common in systems where ammonia in septic-tank leachate is converting to nitrate. Although present in quantities that are over a million times less than those needed to give Monroe’s water that “sweet caffeine kick,” caffeine and artificial sweetener at the top of the water table underlying Monroe is a strong indication that the high density of septic tanks is impacting groundwater quality. Nitrate in groundwater south and west of Monroe is elevated above background levels. Here, septic tanks are widely dispersed and irrigated farming and livestock management are widespread. Chloride-to-bromide mass ratios in groundwater in this area are not indicative of human sewage, and food additives and pharmaceuticals that may be present in human waste were absent. The most likely source of elevated nitrate in this area is runoff and infiltration of irrigation water from fields fertilized with manure or chemical fertilizer, and/or infiltration and runoff from livestock pens and waste containment pits. Chemical signatures in groundwater north of Monroe point to mixed sources of water-quality degradation. Indicators of septic-tank influence (chloride-to-bromide mass ratios) and agricultural influence (pesticides) do occur, but most wells show neither of these markers. Groundwater flow in the valley-fill aquifer likely carries contaminants northward from the agriculture-dominated south and west areas and the septic-system-dominated Monroe area to mix with local septic-system and agricultural contaminants in this area. Water managers and residents can use the information provided by this study to protect the area’s groundwater resources from further water-quality degradation.